Pile Driving, both displacement piles (reinforced pre-tensioned prefabs) and replacement piles (piles driven in situ). Diaphragm Walls, reinforced concrete or plastic walls, the function of which is both structural and for waterproofing. Our Small Diameter business are Special Foundations that combine traditional micropile, anchor bracing and grouting techniques with more modern systems such as Jet and Super Jet Grouting or Compaction, Balance and Consolidation Grouting. 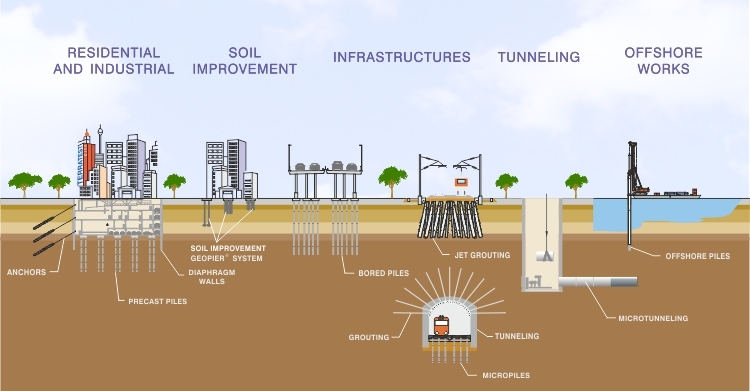 In soil improvement with techniques of stone columns, by vibration, and techniques of with GEOPIER® systems by rammed aggregate piers (RAPS) and rigid inclusions, and intense dynamic compaction. Environmental activities, which aim to solve a wide range of problems such as bio-remedies, soil decontamination, water table control.